It seems fitting to (re)start writing these brand stories by focusing this week on Kodak. For many reasons, talking about Kodak fits nicely between my day job as a branding/graphic designer and my side passion project, which is creating screenprinted artworks that celebrate iconic branding and graphic design. Throughout its history, Kodak has produced so many beautiful examples of design and I’ve always admired the way in which the brand speaks in a bold and graphic language. From their early advertisements to the packaging and product design of the 70s. Kodak will forever be ingrained in my memory through golden yellows and Kodachrome rainbows. But it’s not just the visual language of Kodak that interests me, it’s the whole story of how it came to be, what the brand has done for our society and how it has impacted our modern lives. There’s also a sort of branding moral lesson to be learnt from Kodak too, which is that no brand, no matter how popular, wealthy or iconic it is, can ever afford not to listen to its customers and adapt itself to their needs. Good branding doesn’t mean good business. My memory of Kodak goes all the way back to the first camera I remember my parents having (and me being able to use). It was a simple Kodak Star 110 - one of those really slim snappy cameras that looked like it’d been stood on and squashed. My parents weren’t creative, we didn’t have an instamatic or anything trendy like that, just a simple Star 110. Looking back at old family photos, even this most basic Kodak camera didn’t do a bad job of capturing my childhood memories and family occasions - even if it wasn’t as cool as an instamatic. Of course, it’s not just my memories that Kodak have helped capture, in fact by far the most significant event in the history of amateur photography was the introduction of the first Kodak camera in 1888. Overwhelmed and frustrated by the size and weight of the camera equipment he planned on taking on his vacation, American businessman and entrepreneur, George Eastman set about inventing a lighter and easier to use camera that would be accessible to everyone. This single idea almost single-handedly created the notion of amateur photography. Before this, Photography was a professional vocation which required skill and technical expertise to operate the photography equipment. George Eastman's first Kodak camera was ‘The Brownie’ - a simple box camera costing $1 which was pre-loaded with a 100-exposure roll of film (costing a further $15). When the roll was finished, you would send the entire machine back to the Kodak factory in Rochester (US), where it was reloaded with a new film and returned to the customer while the first roll was being processed. By innovating and leading the photography market Kodak grew from strength to strength, and since the first Brownie camera, Eastman’s Kodak has been responsible for bringing us roll film, movie film, daylight film, the 35mm format, non-flammable photographic film and 16mm and 8mm home movies. Following his death in 1932, Kodak continued to innovate and brought us Kodachrome, Ektachrome, Tri-X, 35mm slide film, color negative film for prints, Instamatic 110 film, the APS format, the carousel projector, Super 8, the PhotoCD format, and, of course, photography as we now know it. It’s these products and the brands graphic and innovative approach which I take inspiration from today and try to present in my own work. From it’s inception Kodak dominated the American photography market. By 1976, Kodak was responsible for 90% of film sales and 85% of camera sales in the U.S and by 1988 employed over 145,000 people. Those kind of numbers and market share are mindblowing. If it were to be matched in 2016, it’d require Apple and Samsung to merge their camera phone businesses and still they wouldn’t come close (they’d still only have about 70% of the US market). The colourful 70s, which inspire my own design work, weren’t even Kodak’s ‘moment’ - the company ‘peaked’ in 1996. By this time they had over two-thirds of the GLOBAL market share and their revenues reached $16billion. Stocks were $90 a share and the company was worth over $31 billion. As a direct comparison in 2016 - that’s roughly what Shell, Amazon and Walt Disney are worth and It’s more than Nike, Nestle, Intel and Ford. In 1996 Kodak was the world’s 5th most valuable brand. In 2016, according to Forbes, that spot is held by Facebook. It’s at this junction where you have to ask the question, when and how does a company become more than a business, and becomes part of popular culture and our society in general. Kodak is known, recognised and admired the world over, it’s even entered the western world vernacular with terms such as ‘Kodak moments’ Kodaking, Kodakers and Kodakery. In my opinion, Kodak's incredible success goes back to George Eastman's original mission: To make photography as accessible as the pencil. He enabled millions of ordinary people across the globe to tell their story and capture their ‘Kodak moments’. It was this brand mission, along with constant product innovation that led to Kodak's success… and it’s eventual downfall. January 19th 2012 - Another classic Kodak moment? Not quiet. It's the date that the world's most popular and famous photography brand filed article 11 bankruptcy. The day that over 100 years of innovation was left in tatters. I remember the day particularly well as my girlfriend was working on the Kodak PR account. Through her, I’d followed the whole story. Over time Kodak weren’t using their PR team to tell their stories or promote their products, they became a fire fighting service as Kodak fell deeper and deeper into trouble. Emergency meetings became the norm. It was sad to see the decline, but in truth, it was set in motion decades ago. Immensely successful companies can become myopic and product oriented instead of focusing on consumers’ needs, after all - selling products makes money. Corporate cultures are set up in such a way that they can start to believe that its company's strength is its brand and marketing, and it underestimates the power of consumer markets. Kodak did not fail because it missed the digital age. It actually invented the first digital camera in 1975. But, instead of marketing the new technology as they did in 1888, and become the market leaders in digital, the company held back for fear of hurting its lucrative film business, even after digital products were reshaping the market. This blind faith that it’s brand and marketing had the ability to overcome the threat from the new technology proved fatal. Kodak failed to adapt to a new marketplace and new consumer attitudes. Kodak made a classic mistake: it didn’t ask the right question. It focused on selling more product instead of the business that it was in, storytelling. That’s what led to it’s downfall and the inevitable day of 19th January 2012. Nostalgia or the beginning of a new era? Last month (October 2016) Kodak announced a rebrand alongside product launches for a new Super 8 and a smartphone (Ektra). They say that the brand is focusing on what they do best - making creative tools for the masses, but this time combining digital and analogue. 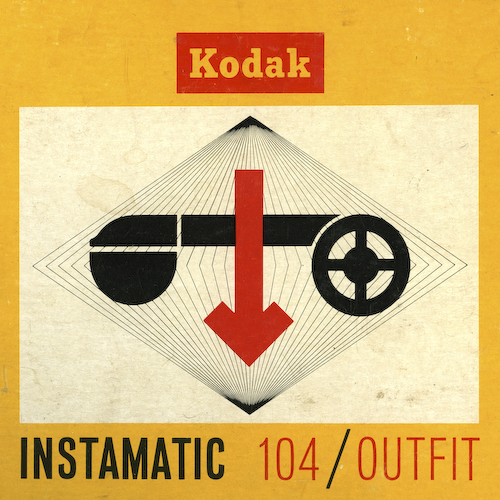 The new products and brand certainly play to our nostalgic view of Kodak. With the logo inspired by the 1970s version and the smartphone taking it’s aesthetics from a 1940s camera. But are Kodak in danger of overestimating the value of nostalgia and the power of their brand again? How many people buy a technology product based on what a brand USED to be? Surely if they’d learnt any lessons it’d be that Kodak enable people to tell stories, not Kodak creates products that look good and enables creativity. I fear that they’re missing the point going after a small niche of creatives, and that no matter how beautiful and graphic the rebrand is, they’re setting themselves up to fail. Yes I’m tempted to buy the Ektra smartphone, yep I think relaunching the Super 8 is kind of cool… but does it move a brand forwards? Will Kodak ever be truly innovative again or will they forever be playing catch-up? Will people outside of creative circles care for Kodak anymore? I made the same mistake a couple of years ago when Nokia made a comeback with the Nokia Lumia smartphones. Nokia pulled on my teenage nostalgic strings and I thought they’d be great. But their products weren’t anywhere near as good as what Apple and Samsung offered and Nokia just hasn’t made much of an impact in a market they were once the leaders and innovators of. For Kodak it remains to be seen just how much value nostalgia will have. But there’s no denying their history and the incredible designs and innovations they’ve given us over the last 128 years.